Have you been searching for a large vehicle that can carry a large amount of cargo and up to eight passengers in comfort? If so, head over to Charlottetown Toyota in Charlottetown, Prince Edward Island (PEI). At our dealership, motorists can explore a sizable collection of vehicles including the Used Toyota Sienna. As one of Canada’s top-ranked Toyota dealerships, we have served PEI for a number of years with our best prices on all vehicles. Stop by Charlottetown Toyota at 1 Superior Crescent and discover a used Sienna today. A Certified Pre-Owned Toyota in unlike any other used vehicle on the market today. Every Certified Pre-Owned Sienna goes through an in-depth checklist before going on sale. Each minivan is less than six model years old and has less than 140,000-km on it. Before hitting out showroom floor, every vehicle undergoes a 127-point inspection that’s completed by our factory-trained technicians. If our specialists find anything that needs to be restored, then they use genuine OEM components. Every minivans also comes with a clean title and a CARFAX Report. On top of going through a long checklist, every Sienna also has an extensive warranty. Every minivan comes with a 12-month/20,000-km comprehensive warranty that includes roadside assistance and a powertrain warranty. The Sienna also comes with a 7-day/1,500-km exchange privilege, the first oil change at no charge and a free tank of gas. Unlike other used vehicles on the market, a Certified Pre-Owned Sienna can be enjoyed on a routine basis with ease. At Charlottetown Toyota, we’re known for getting drivers a great deal on a used Toyota. At our dealership, we have a great finance team that is capable of getting motorists an astounding rate on a used Sienna. If you’re concerned about your less than stellar credit, then spend some time with our finance team that will secure an outstanding loan that works for you. Before paying our dealership a visit, explore our website and fill out a finance application. With this accessible tool and our gifted staff, you’ll be driving home in a pre-owned Sienna today. When it comes to getting into a modern minivan that can seat up to eight passengers with ease and all of your cargo, then check out the Pre-Owned Toyota Sienna. 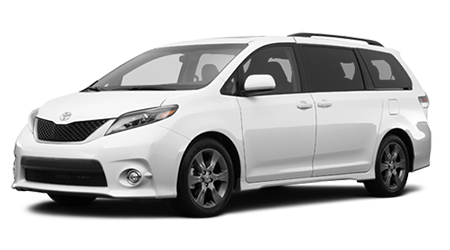 A used Sienna has the same seating capacity, cargo capacity and versatility as a new model, but has an affordable price tag. Visit Charlottetown Toyota in Charlottetown, Prince Edward Island (PEI), at 1 Superior Crescent and test drive a pre-owned Sienna today.